Reading is one of the most powerful and inexpensive tools we have for improving our health. 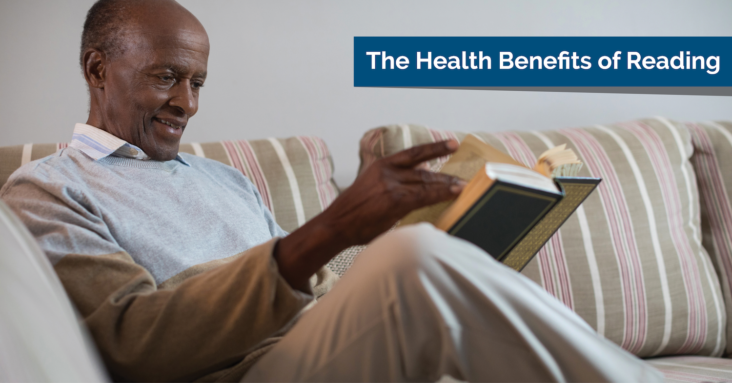 The health benefits of reading are wide-ranging and span our entire lives. From developing our cognitive abilities as children to frequently reading to ward off dementia as we age, studies show that reading is the best exercise for our brains. Here are three compelling reasons to pick up a book today, no matter your age! Mentally stimulating activities, such as reading a book, can help keep memory and thinking skills intact. Research has shown that these activities can stave off a decline in memory as we age. In one such study, the rate of decline in memory was 32% slower in those that participated in frequent mentally challenging activities versus an average frequency. The difference between average frequency and infrequent participation is even more extreme, at 48%. Many have opined that we are as stressed today as we’ve ever been. While it’s hard to define and measure stress, especially over time, who couldn’t use a little less of it? Fortunately, we have a powerful stress-buster available to us in reading! One recent study aimed to find what activities were most effective at lowering stress levels. Using physical indicators of stress, such as heart rate, the study found reading to be the most effective, reducing stress levels by as much as 68%. Reading silently for just six minutes had a greater impact on stress levels than listening to music, drinking a cup of tea, going for a walk, and playing video games. The good news for those who think we’re as stressed as ever? Millennials take advantage of public libraries more than any other generation. The earlier we start reading, the bigger impact it can have on our health! Beside cementing a good life-long habit, reading has many short-term benefits for our youth, too. Reading to our children helps to develop stronger parent-child relationships. Additionally, reading helps children develop stronger comprehension and vocabulary skills, which lead to better school performance. At Vibra Healthcare and Ernest Health, we are privileged to encounter some of the most incredible people on a daily basis. Our patients face, and overcome, serious health issues, doing so with a fierce and unwavering determination to succeed. In doing so, they inspire us all, each and every day. We want to share these incredible stories with the world. Because maybe you, too, are recovering from a stroke or amputation or traumatic injury. Maybe a loved one is living with MS or a brain injury or Parkinson’s disease. Maybe you just need a little motivation to tackle whatever you’re facing today. That’s why we created this short-form podcast called Progress Notes. Every week, we’ll tell the inspiring story of another individual on the podcast. We hope that these stories make your day a little brighter and help you to believe that anything is possible if you put your mind to it. The spinal cord is a part of the central nervous system, along with the brain. Your brain and your body communicate by sending signals through the spinal cord. When the spinal cord suffers an injury, it affects the ability of your brain and body to communicate. Spinal cord injuries are usually categorized as either traumatic or atraumatic. 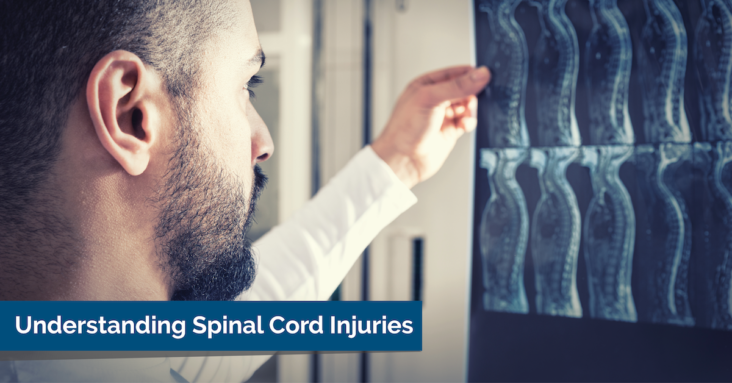 Common causes of traumatic spinal cord injuries include car accidents, falls, and unfortunately, acts of violence. Atraumatic spinal cord injuries can be caused by things like infections, abscesses or even cancer. There are a number of risk factors for spinal cord injury. Men are much more likely than women to suffer a spinal cord injury. About 80% of those who suffer a spinal cord injury are male. Age is another risk factor. Spinal cord injuries occur more often in individuals between the ages of 16 and 30. But there is also a non-demographic risk factor: engaging in risky behavior. Unsurprisingly, this largely surrounds alcohol intake. Consuming too much alcohol increases your risk of suffering a spinal cord injury. Remember, never operate a vehicle if you’ve been drinking. Spinal cord injuries are classified in a few different ways. One is the level of injury. This ranges from the cervical spine in your neck down to the lumbar spine in your lower back. Injuries can happen anywhere along the spinal cord. The location of the injury will impact how it affects a person. Typically, the higher up an injury occurs, the more impairments you will see. There are nerves coming off the cervical spine that help innervate your arms and your hands. The lower down in the spinal cord an injury occurs, the lower the impairments. Additionally, spinal cord injuries are classified by how complete the injury is. A complete injury results in the patient having no sensation or motor function below the level of injury. With an incomplete injury, the patient retains some muscle activation below the injury. They may also have some sensation remaining. Physical therapy focuses on treating the injury with the goal of improving the patient’s mobility. That might mean getting in-and-out of bed or a wheelchair or propelling a wheelchair. Occupational therapy focuses on helping individuals with daily tasks. These include dressing, bathing, and cooking. Another important component of recovery is working with the patient’s family. Educating and training the family should be a part of any rehabilitation program. This not only helps the patient with their day-to-day lives, but also with preventing the secondary effects of spinal cord injuries. Taylor Carlson PT, DPT is a physical therapist at the Rehabilitation Hospital of Northern Arizona. Taylor recently graduated from Northern Arizona University with his Doctorate degree in Physical Therapy. Taylor enjoys working and treating all patients and diagnoses, but especially patients with spinal cord injuries and other neurologic conditions. While currently gaining clinical experience, Taylor would like to pursue his Neurologic Certified Specialist (NCS) certification. Taylor enjoys staying active, being outdoors, and spending time with family and friends. It’s easy to make the case that the brain is one of our most important organs, perhaps the most important. When the brain gets damaged, it can affect how we speak, behave, move, and eat. As a registered dietitian, nutrition is my passion – so let’s take a closer look at how nutrition can affect our ability to heal and recover from a brain injury. There are two main types of brain injury – traumatic and non-traumatic. Traumatic injuries include just that: trauma, such as falls, car accidents, sport injuries, and more. Non-traumatic brain injuries include strokes, seizures, infections, and lack of oxygen to the brain. With either type of brain injury, it can become difficult, dangerous, or simply impossible, to eat. But, your body (and your brain!) still needs nutrition to survive. In fact, the body’s protein and calorie needs can rise to double the normal resting requirements after a brain injury. We also know that early ‘feeding’ is critical to good outcomes. So how do we do this? A feeding tube can be critical for survival when a patient cannot safely eat by mouth. Best practice guidelines recommend early use of enteral nutrition – optimally in the first 72 hours after the injury. This is associated with improved outcomes. Tube feeding can provide the body with the protein and calories it needs to slow breakdown of lean body mass, and help control the extent of the body’s inflammatory response. There are specialty tube feed formulas that your clinical dietitian may use to help manage this response. Nutrition needs, along with fluid and electrolytes requirements, may change and fluctuate frequently during the immediate days and weeks, and require close monitoring. In the recovery phase, it is time to start evaluating whether the patient can eat and drink by mouth again. Depending on the part of the brain that was affected, dysphagia, or difficulty swallowing, is common. Patients may work with a speech therapist to help them start eating and drinking safely. This phase may also still require nutrition support, tube feeding, or nutrition supplements, until the patient is able to eat and drink enough on their own to meet their nutrition needs. So, what can we do to help ourselves and our loved ones in the event of a brain injury? Good nutrition before the injury happens is linked with better outcomes. So take a few moments to evaluate your nutrition, and reach out to a registered dietitian if you need support. Once in the hospital, advocate for your (or your loved one’s) nutrition – find out what the nutrition plan is and speak with the clinical dietitian at the facility. 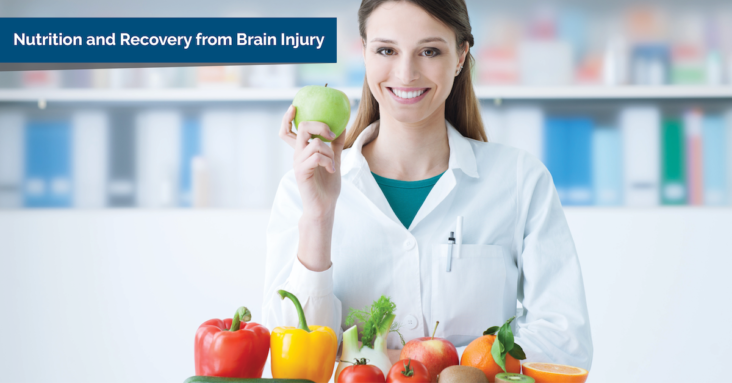 Good nutrition before, during, and after a brain injury can help support healing, strength, and improve outcomes. Kate Nelson, MS, RD, CNSC is a Clinical Dietitian at Vibra Hospital of Denver. She is passionate about clinical nutrition and recently passed her Certified Nutrition Support Clinician (CNSC) exam in April of this year. She has also worked in acute care and skilled nursing facilities, and had a previous career as a Park Ranger with Colorado State Parks. At home, she spends her time cooking delicious meals for family and friends, cheering on the Denver Broncos, and spending time with her husband and beloved Boxer pup, Nemo. In the world of sports, a mild traumatic brain injury is also known as a concussion. Despite the word “mild” and the frequency with which we hear the term, concussions should be taken seriously. If your child competes sports, take some time to speak with your coaching staff about concussions. This is especially important with contact sports. To stay informed on how the coaches manage a suspected concussion, ask the following three questions. 1. What is your procedure if you suspect someone has suffered a concussion, either in practice or a game setting? It is important to know how this is managed in practice, as well as a game setting. Game settings tend to be more formal as compared to practice, but the risk can be the same in both settings. 2. Do you have a concussion management protocol? This would be something that spells out clearly how they manage someone they suspect has suffered a concussion. It should cover from the suspected injury through a return to competition. 3. Do you have staff on site during practice and games that are trained in assessing for concussions? The ultimate goal is to be confident that if your loved one suffers a concussion, they can be properly treated and safely return to competition. If you suspect your child has suffered a concussion, follow up with your physician, or another care provider trained in managing concussions. Kevin Nicholson, PT is the Director of Therapy Services at Vibra Rehabilitation Hospital of Amarillo. 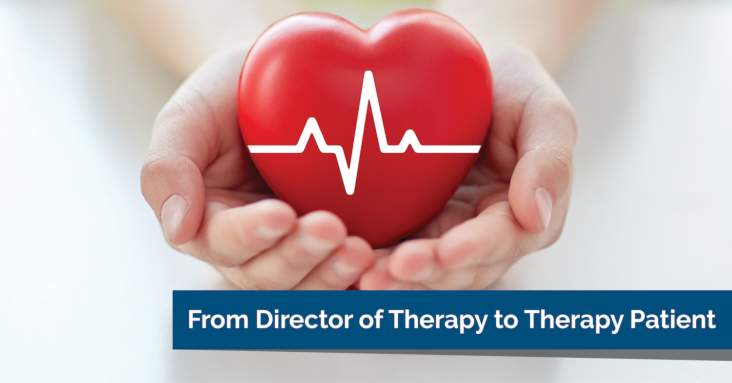 He is passionate about stepping out of the normal “therapy box” to help patients improve and return home. He has also worked as a PT assistant prior to becoming a PT, and has a combined 31 years of experience in the field of physical therapy. In his off time he enjoys watching professional basketball and mixed martial arts, and he enjoys barbell training. Mar 12 Comments Off on Concussion Facts: True or False? Concussion Facts: True or False? Mild traumatic brain injuries, also known as concussions, are the most common form of brain injury. Yet, there are many misconceptions regarding concussions. Unfortunately, this can lead to undiagnosed and untreated brain injuries. To help raise awareness about concussions, we’ve assembled this short quiz. How much do you know about concussions? Test your knowledge of concussion facts with the “True or False” questions below. 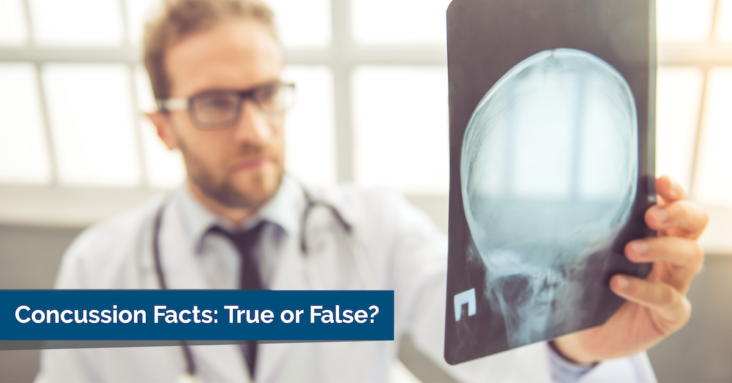 True or False: A concussion is defined as a blow or jolt to the head that causes changes in brain function? True. Our brains use nerve impulses to talk to different parts of the brain. When there’s a jolt or blow to the head, it can cause changes in the flow of those impulses, which then causes changes in brain function. True or False: You can only get a concussion if you play sports? False. 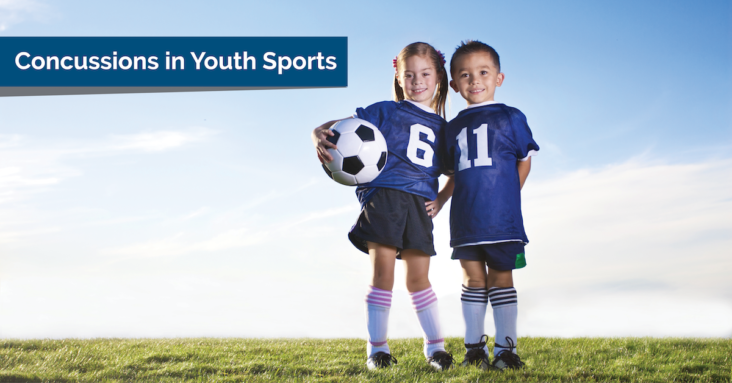 While it is true that concussions can happen during sports, they can also happen to anyone, at any age, at any time. 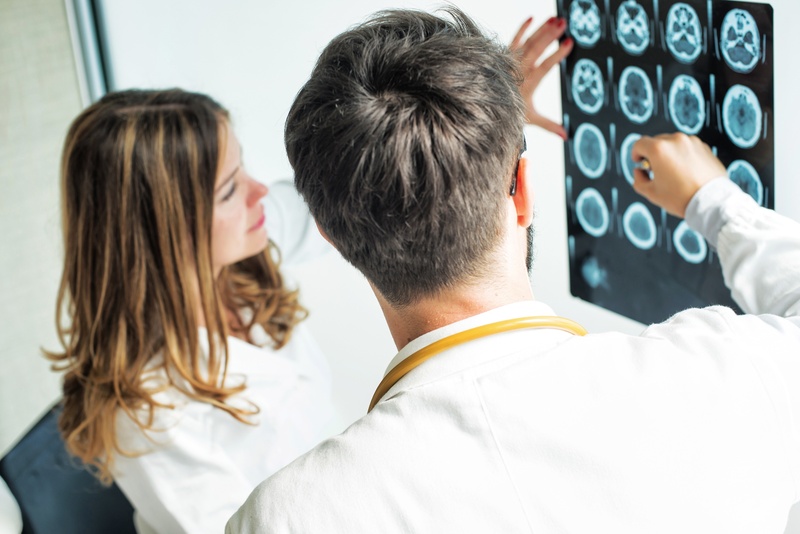 A few examples of where brain injury occurs is in falls, both in the elderly and in children, motor vehicle accidents, and even bike accidents in children. True or False: You must “black out” in order to have a concussion? False. Losing consciousness happens in only approximately 20% of concussion cases. Some signs to watch out for besides the “blacking out” include loss of memory of the events before, during or after the event, and feelings of confusion or even slowed thinking. True or False: It is possible to have a concussion and not realize it? If you feel like any of these things pertain to you or a family member, speak to your primary care physician about your concerns. He or she may refer you to a speech language pathologist, a physical therapist or occupational therapist who are trained to help those following brain injury. Eva Baltz is a speech-language pathologist at Elkhorn Valley Rehabilitation Hospital in Casper, Wyoming. She obtained her bachelor’s degree in Speech, Language, and Hearing Sciences from the University of Wyoming and her master’s degree in Communication Sciences and Disorders from Rockhurst University. Eva is passionate about providing individualized treatment of aphasia and traumatic brain injury. She is an educator at heart and constantly seeks opportunities to promote education of her field. In her spare time, Eva enjoys exploring new places and photography. Danielle Nielsen, OTR/L, CMPT is an Occupational Therapist at EVRH. She completed her master’s degree in Occupational Therapy from the University of North Dakota in 2016. She enjoys providing the best care for each and every one of her patients. Danielle is passionate about everything she does and always strives to find the fun in life. 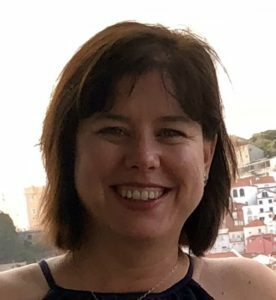 She is a Certified Manual Trigger Point Therapist, completing her dry needling certification in 2018. In her spare time, Danielle enjoys spending time with her friends, family and her dog, Franklin. Colleen Powers is a speech-language pathologist at EVRH. She obtained her bachelor’s degree Communicative Sciences and Disorders and master’s degree in Speech-Language Pathology from the University of Montana. Colleen focuses on providing personalized and evidence-based therapy for people with communication, cognition, and/or swallowing disorders. Outside of work, Colleen enjoys skiing, hiking, and traveling. 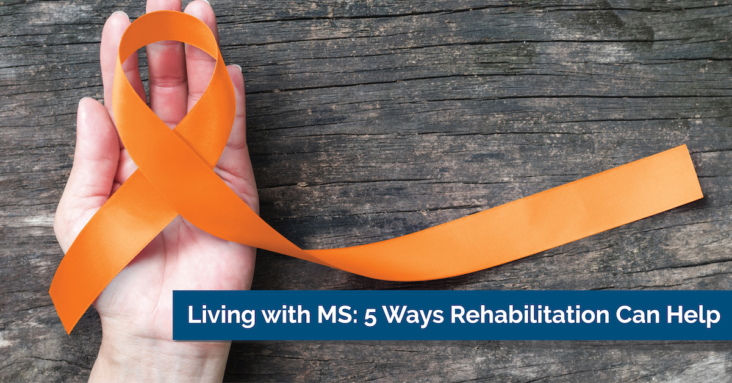 According to the National Multiple Sclerosis Society, rehabilitation is “an essential component of comprehensive MS care.” This starts at the time a person is diagnosed with multiple sclerosis, and can be used to achieve many goals. Individuals living with MS often find difficulty with walking and mobility. These problems can manifest in a variety of ways. They include balance issues, muscle tightness or spasticity, numbness, weakness and fatigue. Physical therapy helps to address these issues, reducing the risk of falls that might cause further injury. Multiple sclerosis can also pose challenges when it comes to caring for oneself. Many of the same symptoms that affect mobility can make it difficult to complete tasks we often take for granted. Occupational therapists work with patients to insure they can safely groom and bathe themselves, get dressed and cook their meals. MS can affect speech in several different ways. Lesions in the brain can cause changes in speech patterns, while muscle weakness in the mouth and tongue might result in words being slurred. Speech disorders are known as dysarthrias. Speech language pathologists provide therapy to address dysarthria and improve verbal communication. Additionally, speech language pathologists work with patients to treat issues with swallowing. Difficulty swallowing is known as dysphagia. Because speaking and swallowing involve many of the same muscles, it’s not uncommon for a person living with MS to also suffer from dysphagia. Speech language pathologists treat dysphagia by strengthening the tongue and swallowing muscles. They do this through targeted exercises and other treatments, such as VitalStim. Improving your overall conditioning is one of the most impactful things you can do to limit the effect of MS on your daily life. Doing so can decrease fatigue, improve muscle strength and stability, and reduce pain. The goal is to achieve optimal function at home, at work and in your community. Congestive heart failure is an entity that affects many individuals, and is related to many different causes. Average liquid intake for people with congestive heart failure should be around two liters per day. It’s very important to consistently use the medications that your doctor or caregiver has prescribed for you. Make sure to weigh yourself at the same time of day and record it. Watch for a weight gain of five pounds over three days. This may mean that you need to adjust your medications, and should speak with your care provider. This doesn’t just apply to the salt on the table. Look at the sodium content on the nutrition labels of the foods you are buying, as well. Processed meats and cured items are a couple examples of food items with a lot of sodium in them. Get out and use your heart muscle to help it stay strong. Remember, your heart is a muscle, and it needs to be exercised like any other muscle. 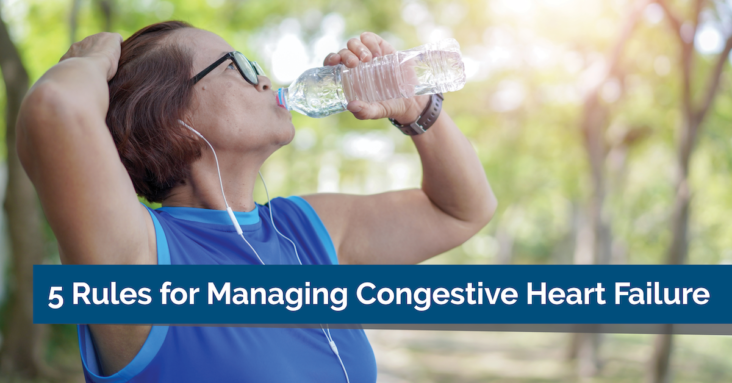 With these five simple steps, managing congestive heart failure can be a lot easier, and you can improve your quality of life significantly. Dr. Sheldon Goldberg is a Board-Certified Specialist in Physical Medicine and Rehabilitation. He has a special interest in the area of wound healing and pain management. He is currently the Medical Director of Vibra Rehabilitation Hospital of Denver. Dr. Goldberg is a Clinical Assistant Professor of Medicine at the University of Colorado at Denver Medical School. He has done research in the area of sound healing and pain management in the past. He is graduate of the Autonomous University of the City of Juarez and his undergraduate background includes national certification as a Physician’s Assistant with special interest in cardiology, rheumatology, and orthopedic surgery. He also holds a degree in Dietetics and Nutrition. Unfortunately for Deb Campbell, suffering a life-threatening heart attack on April 2nd was not an April Fool’s joke. be a heart attack survivor just a few days before her 47th birthday. Deb had been experiencing symptoms of being extremely tired, feeling her heart flutter, and burning chest pain on-and-off for months. She “kept talking myself out of it,” thinking it was heartburn, stress or a virus. While on a boat in Costa Rica, Deb could no longer ignore the symptoms. She thought she was getting sea sick and laid down. Next thing she knew, Deb woke up to a stranger screaming for her to open her eyes. Deb’s heart had stopped beating, and she was unconscious. Eventually aroused, Deb was taken to a local hospital. Doctors found the primary artery sending blood to her heart was 96% blocked. The medical staff treated the blockage and she left for home 10 days later. The Health Insurance and Accountability Act (“HIPAA”) has been providing federal protections for your medical information since 1996. Under HIPAA, you are the driver of how your healthcare provider uses your medical information. It is thus important that you know your medical privacy rights and your healthcare provider’s responsibilities when it comes to your medical information. 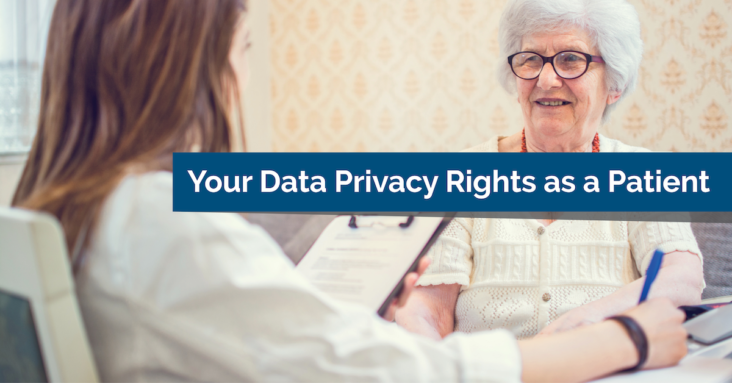 In order to ensure that your medical privacy is protected according to your wishes, it is important to know your privacy rights as a patient and to inform your healthcare providers of how you want your medical information used or shared. It is also important that you review your medical records periodically to ensure that they are complete and accurate. Should you identify what you believe to be an error in your medical record, you should contact the healthcare provider that authored the medical information to find out how to request amendment to your medical information. Knowing your medical privacy rights puts the power in your hands to control who can see and hear your medical information, as well as how your healthcare providers can use and share your medical information! *For more information on how Ernest uses and shares patient medical information please request a copy of your Ernest facility’s Notice of Privacy Practices. Angelique Culver, Esq. has been an Attorney for 15 years, specializing in Healthcare Compliance and the privacy and security of patient information for last 9 years. She is the Chief Compliance and HIPAA Officer for Vibra Healthcare. She has long been an advocate for patients’ rights, serving as a member of the bio-ethics committee of an urban academic medical center and the Georgia Department of Public Health’s Health Information Exchange Legal/Ethical Workgroup. She currently serves on the Board of Directors for WITF, Inc., a Central Pennsylvania public broadcasting company committed to increasing cultural access and knowledge, extending public education, and strengthening community life through all channels and platforms, including broadcasting, online, social media, print, and in person events. Jan 22 Comments Off on Why Donate Blood? Every two seconds, someone in the U.S. needs blood. And while many donate blood frequently, there hasn’t been enough supply to meet demand. But why should you donate blood, if you are able? Unfortunately, there has been a consistent shortage of blood donations across the nation. At the time this blog was written, the American Red Cross has issued an emergency need for blood donors. A blood shortage can lead to delays in providing medical care to patients, which in many cases is lifesaving. There is a particular need for Type O blood, which is often in high demand. There are eight common blood types, but many more rare blood types. For a safe transfusion, there are very specific ways in which blood types much be matched. For example, someone with Type O blood can donate to all other blood types. However, they can only receive Type O blood. To donate blood, you can find a Blood Drive near you on the American Red Cross website. Additionally, many of our hospitals host blood drives regularly, and usually announce them on Facebook. 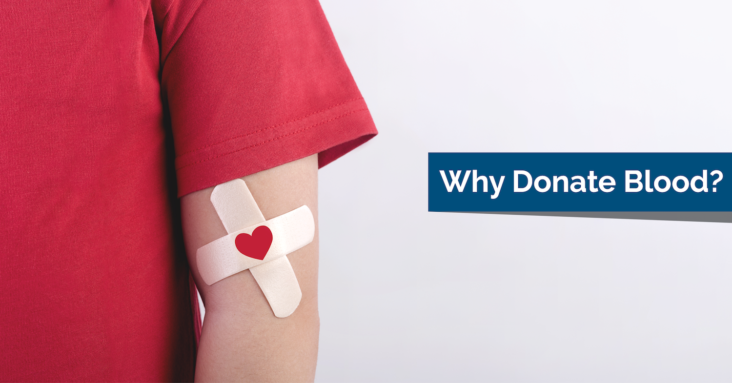 If you haven’t donated blood before, check out these common concerns for first-time donors. The winter months bring many wonderful things. The start of a new year. A beautiful, fresh fallen snow. Fun on the slopes. But the winter also brings something of great concern: a spike in traumatic brain injuries. Despite the drop in temperature, many still enjoy the outdoors during winter by participating in sports like skiing, snowboarding, ice skating, sledding and ice hockey. But winter sports pose a legitimate danger to your brain if you do not take proper care to protect yourself. 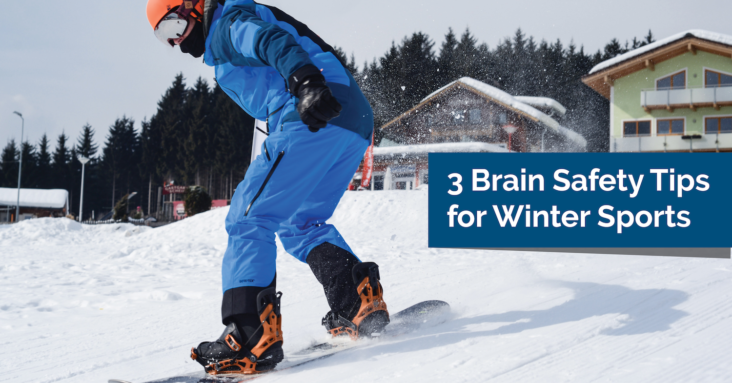 To fully enjoy these winter activities, it is important to understand and respect the risks that winter sports pose, including concussions. Know these winter sports safety tips to enjoy all winter has to offer. Protecting your brain starts with wearing a helmet. Be sure to choose a helmet that fits properly, and is designed for the sport you’ll be participating in. Regularly check your helmet for damage, including dings and scratches that may limit its effectiveness. When planning a trip to the slopes, look at the weather forecast. Try to plan for optimal conditions to reduce the risk of injury. Know how the trail is laid out, and where the boundaries are. Stay near the center to avoid obstacles, and try to avoid crowded areas. Headphones are a big no-no, as they won’t allow you to hear what’s happening around you. Don’t opt for an advanced trail or equipment if you’re a beginner. Before getting started, know where medical help is available. The same goes for skating rinks and sledding trails. If you or a loved one are experiencing any of these symptoms, seek medical attention within 24 hours. Sometimes, a person loses consciousness after suffering a concussion. In that event, call 911 or seek emergency medical help, immediately. Long-term acute care hospitals (LTACHs) are designed to help patients advance their recovery when traditional hospitals may not have the time or resources to help them. But, when it comes to long-term acute care, there are many misconceptions. 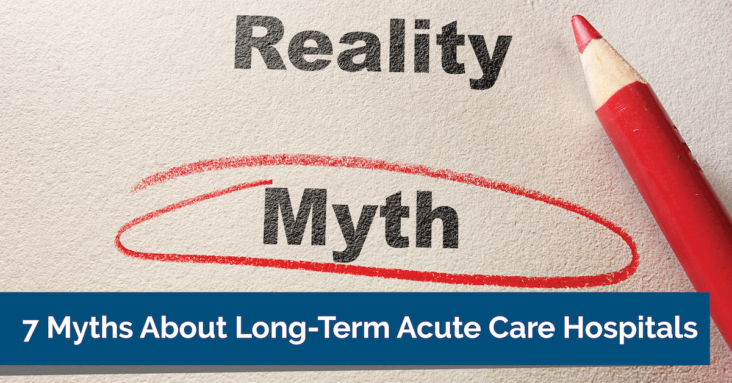 From the services provided to admissions requirements and insurance coverage, we’ve taken some of the most common myths about long-term acute care hospitals and clarified them below. Long-term acute care hospitals are uniquely designed to provide care for patients with complex medical needs. Fact: The amount of time a patient stays in an LTACH is dependent upon their illness or injury, complications and goals. Every patient is different because every human is different. In an LTACH, physicians collaborate with patients and their loved ones to create an individualized plan of care to achieve those unique goals. Fact: Most patients do not receive hospice care while staying in an LTACH. Long-term acute care hospitals focus on getting patients back to their life in their community. Patients and their families choose LTACHs because they offer aggressive treatment for the disease or injury. Fact: While most patients in an LTACH are quite ill, early mobility is essential to a patient’s long-term outcome. LTACHs have therapists on staff who provide services specific to this level of care. Patients in an LTACH may begin receiving physical and/or occupational therapy even while on a ventilator. The physical and occupational therapists will create a therapy regimen appropriate for each patient. Fact: Much like an intensive care unit, LTACHs focus on critical care of patients. Nurses and staff are specially trained to care for patients who are critically ill or have a complicated medical history. Fact: There are no stay requirements for LTACH patients. Patients can admit from a doctor’s office or even their home, if needed. Fact: Most LTACHs have contracts with numerous insurance companies. LTACHs work directly with insurance providers to ensure coverage prior to a patient’s admission. Dec 18 Comments Off on What is LSVT BIG? LSVT BIG is a research-based exercise program developed from the principles of the LSVT LOUD program. The LSVT BIG program has been developed specifically for patients with Parkinson’s Disease. With over 20 years of research, the program has shown documented improvements of faster walking and bigger steps, improved balance, and increased trunk rotation. 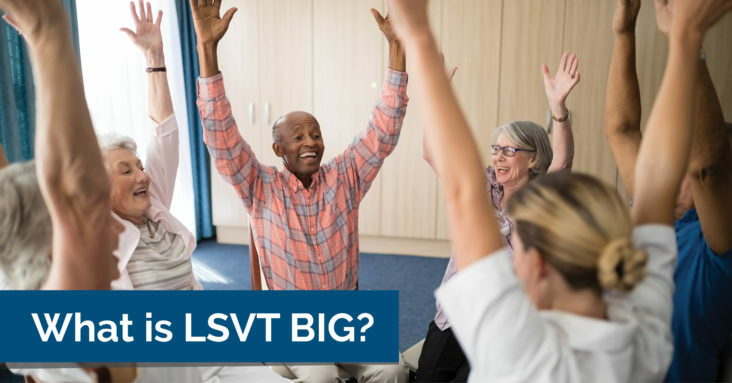 How does the LSVT BIG program work? The LSVT BIG program drives high-intensity and high-effort practice in order to teach the amount of effort required to produce normal movements. The exercises translate into bigger movements in everyday activities. How long does the LSVT BIG program last? The LSVT BIG program consists of 16 sessions. Patients attend four sessions per week for four weeks. Each session lasts 1 hour. Patients are also expected to do daily homework. When is the LSVT BIG program appropriate? Patients with Parkinson’s Disease can participate in the LSVT BIG program at any time during their disease process. However, research suggests that the earlier a patient gets into the program, the more beneficial it can be. The exercise program can be modified to accommodate patients at different levels of mobility. The LSVT BIG program consists of seven maximal daily exercises, five functional tasks, and one-to-three hierarchy tasks. The maximal daily exercises are standard exercises that all patients perform. There are two seated and five standing exercises. These exercises focus on sustained posture, trunk rotation, balance, and stepping. The five functional tasks are made custom to the patient’s needs. These are one step tasks, such as sit-to-stand, turning, backwards stepping, etc. The hierarchy tasks are also custom to the patient’s needs. These are more complex tasks, such as getting on-and-off the floor, getting in-and-out of bed, getting in-and-out of the car, etc. How will the LSVT BIG program be customized to fit my needs? The LSVT BIG program is custom made for each patient, dependent on the patient’s needs and goals. During the evaluation, the therapist will perform numerous standardized tests to determine the patient’s limitations. The therapist will also discuss in detail with the patient the challenges they are having and their specific goals. The program is then tailored to fit the patient’s deficits and goals through different functional and hierarchy tasks. The standard maximal daily exercises can be modified to be made easier or more difficult, based upon the patient’s level of function. How do I get started with LSVT BIG? To get started with the LSVT BIG program, you first need a prescription for the program from your doctor. This may come from your primary care physician or your neurologist. Then contact a facility that has LSVT BIG trained therapists. You can search for an LSVT Certified Clinician near you on the LSVT Global website. Danielle Albin, PT, DPT, CSRS, LSVT BIG, is a physical therapist in the outpatient department at Gateway Rehabilitation Hospital. She has been a physical therapist for over 5 years with experience in inpatient rehab, outpatient, and skilled nursing facilities. She graduated from University of Kentucky with her Doctorate in Physical Therapy in 2013. Danielle is certified in LSVT BIG and also has her stroke certification (CSRS). Danielle is passionate about improving the way in which patients with Parkinson’s Disease move and perform their daily activities. Dec 11 Comments Off on What is LSVT LOUD? LSVT stands for “Lee Silverman Voice Treatment.” The LSVT LOUD program was designed for Lee Silverman, a woman with Parkinson’s disease who was dealing with voice impairment. The goal of the program is to increase vocal loudness to a healthy, normal loudness so the patient can improve communication with others. The exercises in the program target loudness, but also improve pitch, breath support, and dysarthria. LSVT LOUD was created for Parkinson’s Disease, but can be useful for other neurological disorders (i.e. Multiple Sclerosis) on a case-by-case basis. Over 25 years of research and randomized control trials through the National Institute of Health (NIH) have shown improvements in loudness, vocal quality, articulation, breath support, and increased intelligibility. Additionally, the principles of LSVT LOUD have been used to develop the LSVT BIG program,which has shown documented improvements of faster walking and bigger steps, improved balance, and increased trunk rotation..
LSVT LOUD consists of high frequency, high intensity, and high effort practice. The goal is to achieve normal, healthy vocal loudness in everyday life. The exercises address bowing of vocal chords, the ability to physically get loud, and to retrain the patient to use a loud voice. The program is four weeks long and the patient comes to therapy four consecutive days per week. Each session lasts 60 minutes. Outside of therapy, the patient also performs home exercises. Patients do home exercises twice per day on non-therapy days and once per day on therapy days. 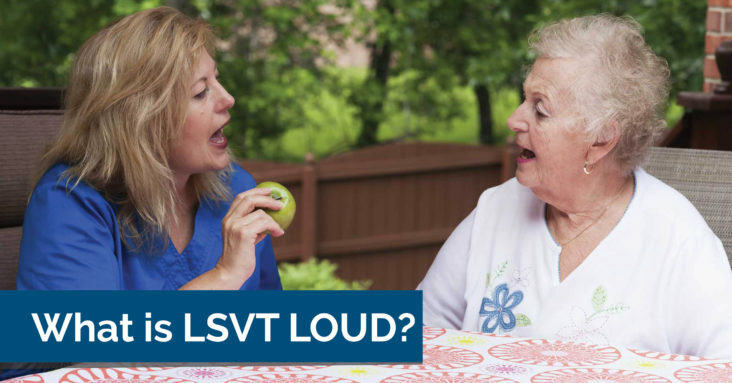 When is the LSVT LOUD program appropriate? LSVT LOUD can be completed at anytime during the disease process. But, studies show the sooner LSVT LOUD is completed, the more beneficial and effective the treatment. Research shows the increased vocal loudness after completion of LSVT LOUD can last for 2+ years if daily practice is continued post-treatment. Using their “LOUD” voice, patients perform a series of sustaining the sound “AH” at different pitches. The patient also practices a series of functional phrases that he or she selects. The patient selects phrases that they say on a daily basis and that are meaningful to them. The aim is that the patient can generalize the practiced loudness to everyday speech. Other hierarchical verbal expression tasks are completed to practice using the LOUD voice in different settings. These tasks start at the word level and advance to the conversation level by the end of the program. Why is LSVT LOUD better than regular voice therapy? LSVT LOUD was specifically created for Parkinson’s Disease. The program gives repetitive, intensive practice with an increased number of sessions. The goal is for the patient to have a greater increase in vocal loudness and longer lasting results than with typical speech/voice therapy. General voice therapy may only be two to three times per week, for 30-45 minutes. Additionally, it does not typically have the intense and repetitive practice LSVT LOUD does. To get started with the LSVT LOUD program, you first need a prescription for the program from your doctor. This may come from your primary care physician or your neurologist. Then contact a facility that has LSVT LOUD trained therapists. You can search for an LSVT Certified Clinician near you on the LSVT Global website. Elizabeth Uchtman, M.S., CCC-SLP, is the lead speech pathologist and primary outpatient speech pathologist at Gateway Rehabilitation Hospital. Elizabeth has been a speech pathologist for over two years, with experience in skilled nursing facilities, acute care settings, and inpatient rehabilitation settings. She graduated from Miami University with a Master of Science degree in speech pathology in 2016. Elizabeth is certified in LSVT LOUD and has a passion for working with adults with diagnoses of voice disorders, aphasia and dysphagia. She holds her Certificate of Clinical Competence (CCC) in Speech-Language Pathology, Ohio state licensure, and Kentucky state licensure. 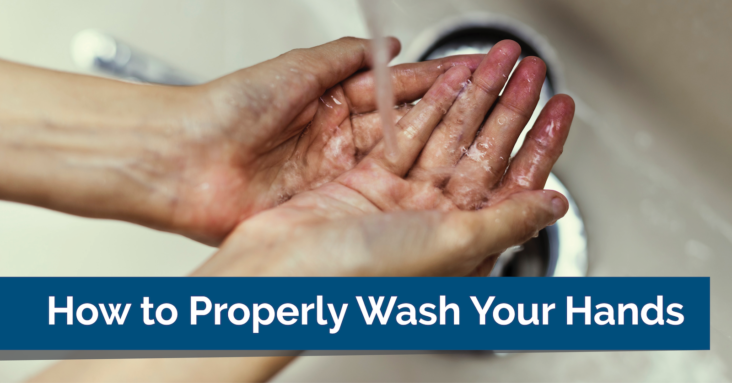 Washing our hands frequently and thoroughly is one of the easiest ways to prevent the spread of germs and infection. This is especially important during flu season. But, are you washing your hands properly? Wet your hands, then apply soap. Tip: Turn off the faucet while applying soap to save water! Lather your whole hands, including the backs, between your fingers and under your nails. Dry your hands using a clean towel or air drier. Oct 24 Comments Off on Passionate, patient caregivers. 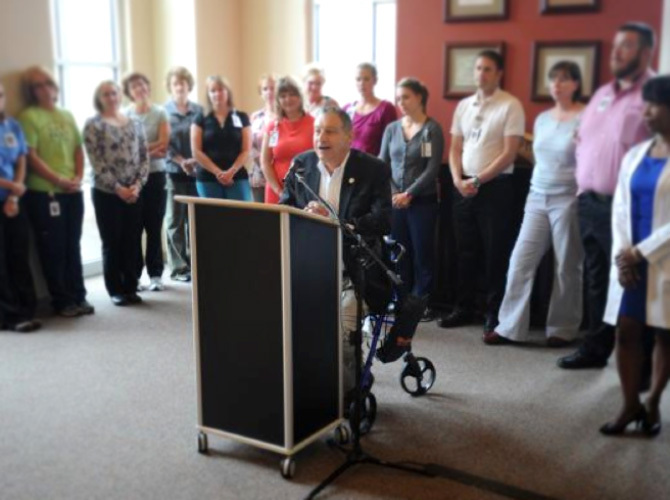 Ken Summers, of Johnstown, Colorado gives testimony to Ernest Health’s true spirit of being passionate, patient caregivers. At Ernest Health, we provide specialized medical and rehabilitative services to our patients through our rehabilitation and long-term acute care hospitals. We treat patients who often are recovering from disabilities caused by injuries or illnesses, or from chronic or complex medical conditions.